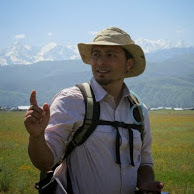 Isaac I. Ullah, PhD is a computational geo-archaeologist who studies the intersection of complexity theory, archaeology, complex adaptive systems, simulation, and early food production. The SDSU Computational Archaeology Lab. Software Development and Addons for GRASS GIS. How can we use the archaeological record to learn about the future? My approach to an open-source data collection workflow. An open-source mobile data collection workflow.